What's New For the 2019 Hyundai Kona? Every trim level of the 2019 Hyundai Kona comes with several safety features that were optional in the past, showing that the car company is interested in keeping people safe. The Kona is a new SUV for the car maker, so major modifications weren't needed yet. This is a subcompact SUV, which is a fairly new vehicle category. It is one that is growing in popularity. 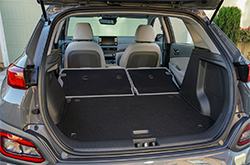 The 2019 Kona can carry five passengers, and Hyundai is offering the vehicle in four trim levels. The trim levels include the SE, SEL, Limited and Ultimate. Standard features include things like front-wheel drive and alloy wheels. You can get all-wheel drive with this little SUV, but it is optional. When you spring for all-wheel drive, you will be driving around in a vehicle with an upgraded rear suspension and a lockable center differential. The latter feature gives you better traction control when you take the SUV off-road or are driving on slippery roads. Standard features with the SE trim level consist of 16-inch alloy wheels, a height-adjustable driver's seat and automatic headlights. You'll also get technical amenities like a rearview camera, 7-inch infotainment system and Bluetooth. Hyundai even added two USB ports, Android Auto and Apple CarPlay smartphone integration to the Kona. If you upgrade to the SEL trim, then your SUV will have 17-inch wheels, keyless ignition and heated front seats. You'll also get the car maker's blind-spot monitoring system and voice recognition. Hyundai is offering an optional Tech package for the SEL. With this one, you'll get a sunroof, an eight-speaker Infinity audio system and the car maker's Blue Link communication system. The 2019 Kona Limited SUV comes with everything included in the lower trims along with a more powerful engine. It also features 18-inch wheels, an upgraded exterior trim and leather upholstery. Your Limited Kona will have LED headlights and taillights as well as automatic climate control. 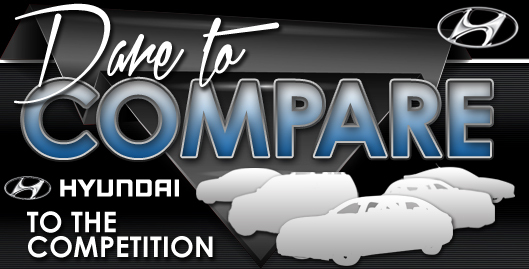 If you want your subcompact to come with every available feature, then you'll want to purchase the Ultimate trim level. This model features amenities like automatic wipers, an 8-inch touchscreen infotainment system and a wireless charging pad. 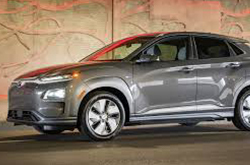 The base 2019 Kona includes safety equipment like a forward collision warning system, lane keeping assist and automatic emergency braking system. It also monitors the driver's attention. Hyundai added additional safety features in the SEL. This model comes with a blind-spot monitoring system that has rear cross-traffic alert in addition to rain-sensing windshield wipers. The Ultimate trim model has safety features like automatic high beams and rear parking sensors. Hyundai even added a pedestrian detection feature to the forward collision mitigation system in the Ultimate model. You'll have top-of-the-line safety equipment when you buy a Hyundai Kona.